SPINELLI B. Violazione dei diritti umani e femminicidi commessi da Isis: come intervenire? 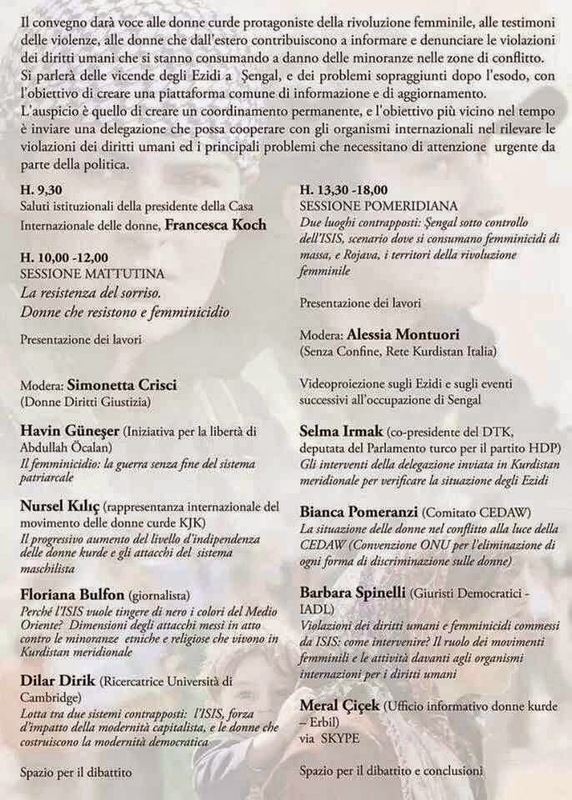 Il ruolo dei movimenti femministi e le attività davanti agli organismi internazionali per i diritti umani, in AA.VV. 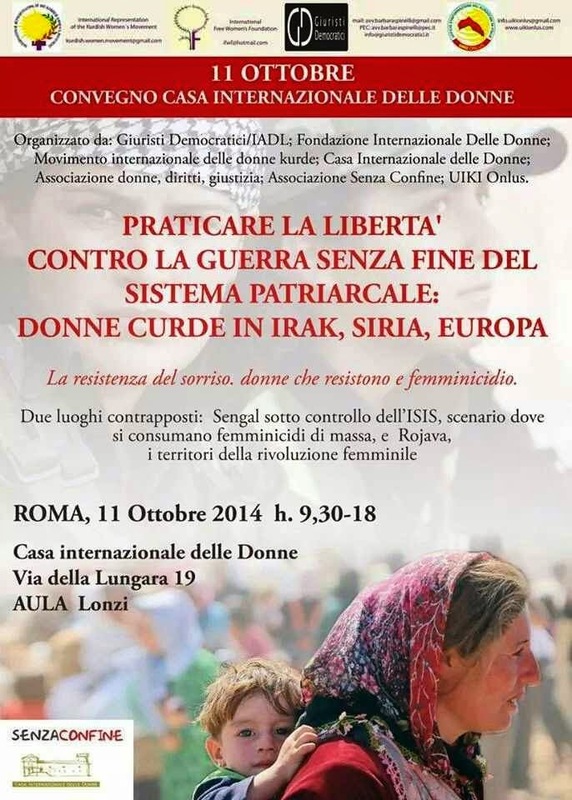 “Donne curde in Iraq, Siria, Europa. Praticare la libertà contro la guerra senza fine del sistema patriarcale”, Edizioni Punto Rosso, 2015. SPINELLI B. La violenza maschile sulle donne, capitolo 3, in AA.VV. “Diritti delle donna. Diritti del mondo”, Manuale di educazione ai diritti umani, OXFAM, 2014, pp. 59-73. Publicado por la Heinrich-Böll-Stiftung – Unión Europea, Edición: Patricia Jiménez, Katherine Ronderos y Carlos Mascarell Vilar - Producido por Micheline Gutman, D/2013/11.850/1, Bruselas, Impreso en Bélgica, Enero 2013, p.34. SPINELLI B. “Femicide and feminicide in Europe. Gender-motivated killings of women as a result of intimate partner violence”, Expert paper presented during the EGM on gender-motivated killings of women, organized by UN Special Rapporteur on VAW, Rashida Manjoo, a New York, il 12 Ottobre 2011. Italy may finally be recognising that women aren't "dispensable"
Italy has just ratified a European treaty which seeks to combat violence against women. It's a small step in the right direction for a country battling a plague of femicides and deeply entrenched sexism, writes Marta Cooper. Deep in Italy’s southern Calabria region, the town of Corigliano Calabro laid to rest one of its residents on Tuesday. Last Friday, just weeks short of her 16th birthday, Fabiana Luzzi was allegedly stabbed repeatedly, doused with petrol and set alight by her boyfriend. Fabiana’s horrifying murder has shocked a country which is becoming increasingly aware of its plague of femminicidio (femicide). Figures from helpline Telefono Rosa confirmed by Italy’s national statistics body, Istat,show that a woman in Italy was killed every two days in 2012, compared to every three days in 2011. Furthermore, 47 women were victims of ‘attempted femicide’ last year, according to the latest research from Bologna-based women’s organisation Casa delle Donne. Efforts are being made to put the issue on the national agenda. In her inaugural speech in March, Chamber of Deputies speaker Laura Boldrini pledged to “take charge of the humiliation of women suffering violence masquerading as love". But in order to really “take charge”, Italy has a bitter pill to swallow first. As Barbie Latza Nadeau writes in this excellent piece, Italy is beset by “a serious cultural flaw that somehow enables Italian men to believe women are dispensable.” It is still a deeply chauvinist and sexist society. Over the past two decades misogynistic perceptions of women have been reinforced by the mass media, with private television channels owned by former prime minister Silvio Berlusconi and state-owned broadcasters regularly casting women as showgirls. A report by the UN’s special rapporteur on violence against women, Rashida Manjoo, also makes for a jarring read. Citing the work of lawyer Barbara Spinelli, Manjoo notes that among the causes leading to femicide are “honour, men’s unemployment and jealousy by the perpetrator”. Consider, too, that it was only in 1981 that provisions in Italy’s penal code which allowed for a reduced penalty for those found guilty of killing their spouse, daughter or sister to defend the ‘honour’ of the family were repealed. This week’s vote will not fix entrenched attitudes in a culture in which women have for so long been solely considered either mothers or lovers. The vote now needs to be repeated in Italy’s Senate in order to officially pass, and the convention itself needs the ratification of at least 10 countries to take effect (Italy is the fifth nation to ratify the treaty). The onus is now on the Italian government to follow through with the convention’s provisions: it can no longer rely on mere rhetoric. Mourning is an intense, slow and long affair in Italy, and now is perhaps a crass moment to show any signs of celebration. But, amid the grief for one teenage girl whose life was so brutally cut short, it is of some reassurance that steps are finally being made to ensure no other girl or woman should face the same fate as Fabiana.